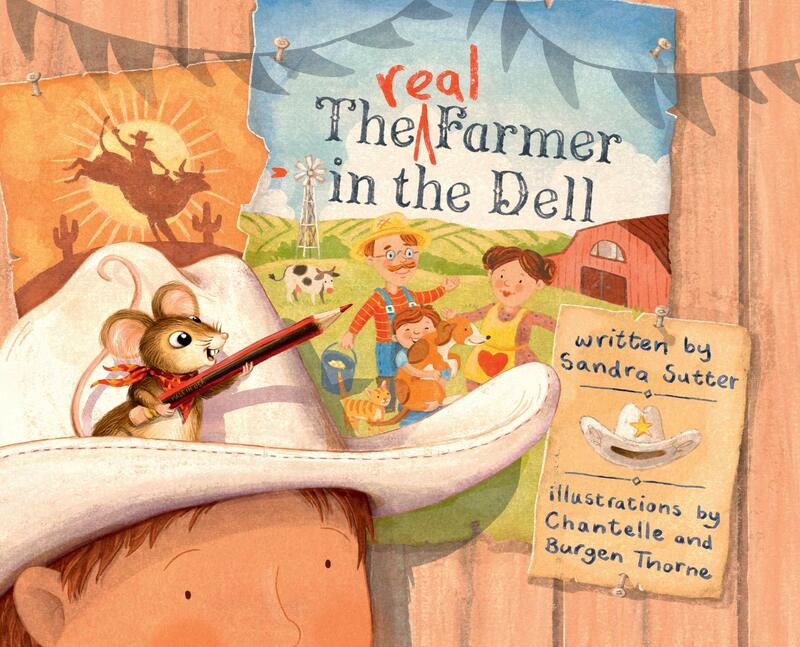 Author Sandra Sutter has a new picture book titled, THE REAL FARMER IN THE DELL. illustrated by Chantelle and Bergen Thorne. It is availabe in bookstores now. Clearfork has agreed to share a book with one lucky winner. All you have to do to get in the running is to leave a comment. Reblog, tweet, or talk about it on Facebook with a link and you will get additional chances to win. Just let me know the other things you do to share the good news, so I can put in the right amount of tickets in my basket for you. Sharing on Facebook, Twitter, reblogging really helps spread the word for a new book. Thanks for helping THE REAL FARMER IN THE DELL! Everyone thinks they know the story of the Farmer in the Dell. But do they really? One little mouse knows the truth and he’s ready to spill the beans. 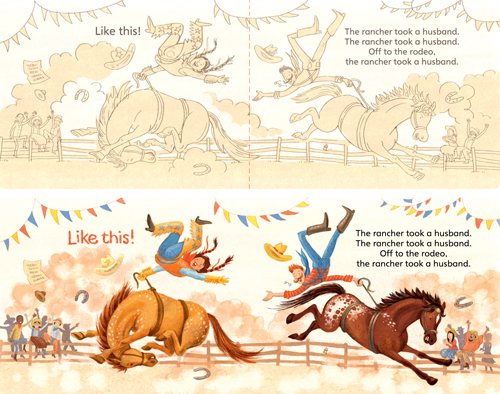 Take a seat in the saddle and hold on to your hat when you open the book and read all about it here. This real-life story will make you question what else might not be true, depending on who’s doing the telling. The story was inspired by a simple question from my son, who was four at the time, about the farmer taking a wife. When I explained that was the way the song went, I decided . . . well, that could all be different. The part of me that likes to challenge assumptions took over, and the next thing I knew, the farmer wasn’t a farmer and the farmer wasn’t a man. What’s real? What a great question! Is anything really ever true, or is the truth a matter of perspective? 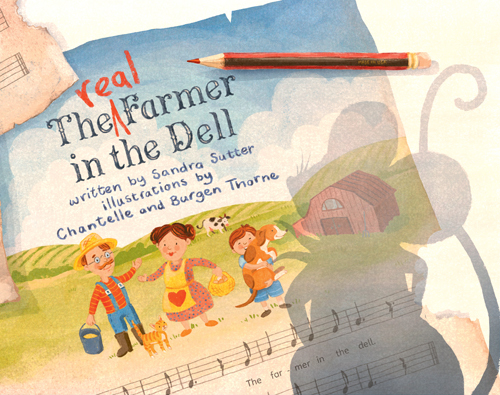 We just fell in love with Sandra Sutter’s story of The REAL Farmer in the Dell and we were super-excited to work on it with dream Art Director/acquiring editor of Spork Mira Reisberg (founder of Children’s Book Academy). Here’s our visual cue: we illustrated the mouse slightly differently to the people – he’s furry, soft and natural-looking with big eyes – the people are more stylised and simplified. Will the reader ask why? We hope so!! When we presented the first sketches of the pages, we’d included a faded cream to show colour areas. Mira picked up on this immediately and encouraged us to go for a washed-out palette of sun-bleached tones that create the perfect feeling of the dusty West where our story is set. We’re so happy with how this limited colour palette worked out! Thank you Sandra, Chantelle, and Burgen for sharing your book and process with us. It looks like so much fun. Please note winner must live in the US due to mailing costs. I love the illustration previews for this book! Great job Sandra Sutter, Chantelle and Burgen Thorne! Thank you, Adriana!! 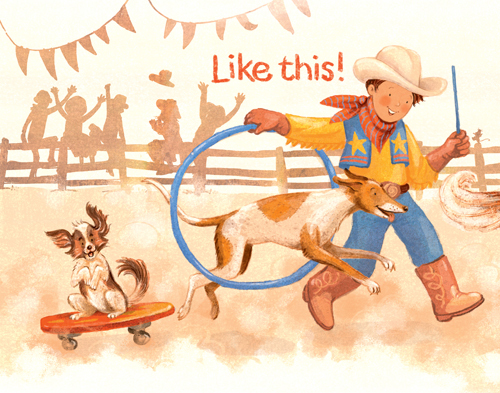 We had a great time doing the illustrations for this book so we’re very happy you like them! Thank you, Adriana! It was a blast working with Chantelle & Burgen. We are so happy that Kathy Temean shared it with you here. Thanks Kathy for featuring our book and organizing this book giveaway – much appreciated. Good luck, everybody! 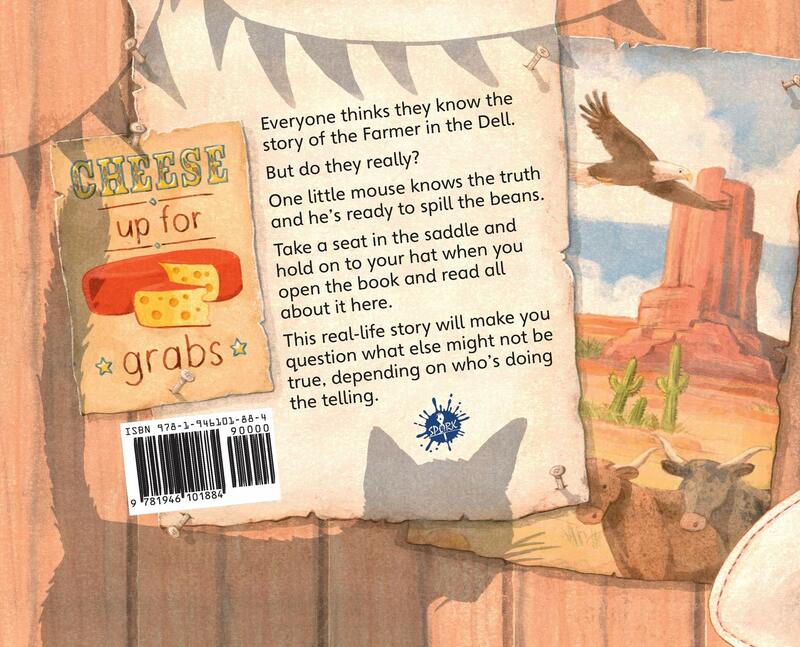 The Real Farmer in the Dell book giveaway is happening right now on Kathy Temean’s blog – ‘Writing and Illustrating’. Head on over to Kathy’s blog for the details. Good luck!! What a great idea for a book! It was loads of fun to write! Thanks! I love when books provide a different take on a familiar children’s song, nursery rhyme, or story. It just adds another element to something children may already know and keeps the fun going. You can read the original first then the new story. Many lessons to be learned comparing and contrasting. Thanks, Ashley! I had fun coming up with ideas to match the new setting, while also finding words consistent with the familiar tune. It’s marvelous! Congrats Sandra, Chantelle and Bergen. Thank you so much, Vanessa!! From a fellow Front Ranger in Colorado, congrats! I like to say ‘recovering attorney’, which also blends nicely with having been a former addictions counselor, too. Thanks for your support, Wendy! Chantelle & Burgen are a dream team to work with! Thanks! What a fun new look at an old classic. Thanks for the chance to win a copy. I’ve tweeted a link to this post: https://twitter.com/carlrscott/status/1108760347140345856, and pinned an image on Pinterest: https://www.pinterest.com.mx/pin/336573772149995216. Thanks again, have a great day!! What a fun story, Sandra. Congratulations on your clever book. Mouse is an adorable narrator. Love the art. Thanks! I love Mouse, too! Thanks you very much 🙂 We had so much fun with this book! A clever story and vibrant illustrations make this book a winner! Thank you, Melissa! You’re the best! Thanks, Melissa! 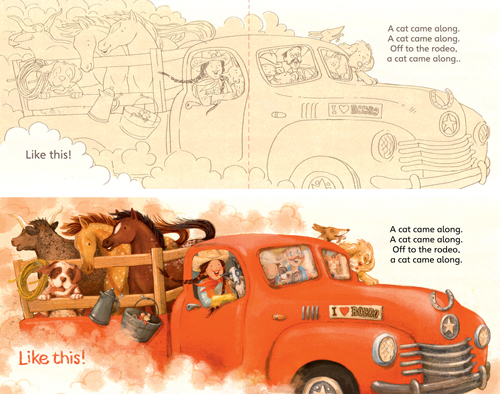 This book was fun, fun, fun to illustrate!! I hope you love it! He has a few secrets to tell. Shhhh.. This book looks so fun! Rodeo!! Who doesn’t like a rodeo, right? I love that mouse is the narrator! I’m really looking forward to reading this fun book! Congrats, Sandra! 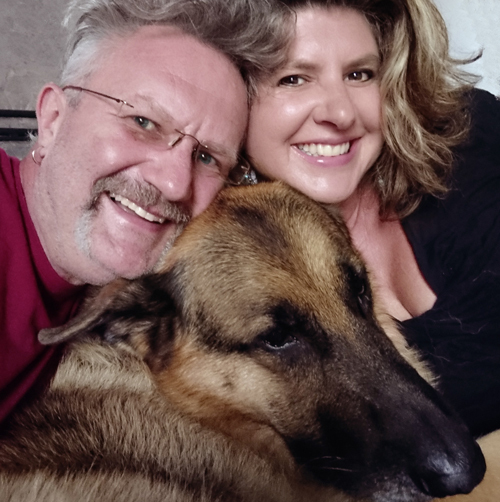 I’m thrilled to read about Sandra’s journey and the illustrating dynamic duo and wife husband team of Chantelle and Bergen! Congrats to all! The book looks amazing and I’m anxious to read the creative retelling from the mouse’s POV! Thanks, Doreen! I hope you love it! This looks like such a fun book. Thanks for telling me about it. This looks like fun. I love the way t was conceived by the author and how the illustrator brought it to life! Thanks for a chance to win. So excited for this book! It has been on my radar for awhile! LOVE the writing AND the illustrations so much! Thanks, Phyllis! You have such lovely artwork as well! Congrats! I love the premise! Love it, and what an interesting ‘backstory’! Thank you, Kathy, for supporting this book and all of us who were part of bringing it to the world! I love this spin. I also loved seeing my favorite breed of horse, an Appaloosa going off to the rodeo. Looks like a really fun read and the illustrations are so lively. Chantelle & Burgen are a dream illustration team! I love the horses too! Yahooo!! Glad you like the illustrations – and the appaloosas! I love books that have parts you can sing! They’re so attention-grabbing! What a clever and adorable book. Good luck to you, Sandra!